EUSTACE, Alfred William (1820-1907), Australian bush artist, poet, spiritualist and taxidermist, was born in the small village of Ashbury, Berkshire, England, son of John Eustace, Head Game-keeper to the Earl of Craven at Ashdown Park. He migrated to Australia with his wife and two older children and arrived in Chiltern in 1851, obtaining employment as a shepherd on the Eldorado Run owned by Jason Withers who also owned the Ullina Run. Alfred always carried a small box of oils in his swag, so that he could experiment with colour and techniques. He taught himself to paint and endeavoured to capture the spirit of the bush. Canvas and paper not being readily available, he turned to using the leaves from the Red and White Box eucalyptus trees. About 1856 he painted a small picture of the Woolshed gold-rush and during the next few years became well known in North-East Victoria. He held exhibitions at Albury, Ballarat and Melbourne and by 1896 he was receiving orders from many of the important European families. Examples of his work were acknowledged by Queen Victoria, Emperor Frederick of Germany, the Czar of Russia and the Governors of NSW and Victoria. Alfred was a skilful taxidermist; the collection of birds and animals in the Beechworth Museum, having been prepared by him. He was a contributor of letters and verse to the Chiltern newspaper and in the 1870s shared in a lively debate on spiritualism. There were six children in the family: Sidney, Kate, Elizabeth, Charles, Emily and Annie; the last four being born in Australia. 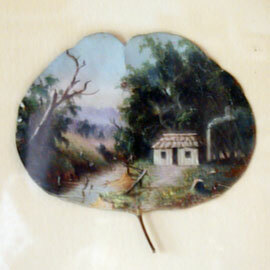 Annie, who married Edward Jessup, successfully followed her father in painting gum-leaf landscapes. A picture by Annie Jessup was presented to the Chiltern Atheneaum by Sidney Eustace, along with his collection of local timbers. Sarah Ann Eustace died on 6th February, 1890 and Alfred passed away on 29th May 1907. Along with their daughter Elizabeth, who lived to the age of 106 years, they are interred in the Presbyterian section of the Chiltern New cemetery.